The Science curriculum cultivates students’ scientific literacy by advancing a quantitative understanding of the composition and structure of the material world. Students learn how to use the tools and methods of scientific inquiry through the integration of close observation, careful measuring and calculating, and rigorous reasoning. They gain extensive practical experience with hands-on exploration, individual and collaborative labs, independent research and experiments, and fieldwork at the John Dorr Nature Laboratory. Students acquire the quantitative and analytical skills needed to grasp, at increasing levels of complexity, the concept that the internal order of nature can be modeled in ways that explain current observations and predict future ones. Through experimental verification of testable predictions, students begin to see that general laws govern the physical universe from the molecular to the cosmological level. As they connect cause and effect and discover sets of scientific principles, students learn to evaluate the interpretive value of empirical, intuitive, and theoretical knowledge for the purpose of scientific inquiry and solving problems. In the Nursery Division, Science is integrated into the curriculum through lessons, activities, and stories that involve the growth and life of plants, animals, and people. Each age group visits the Studio, a well-equipped resource classroom with its own teaching staff, where students work on observation and measurement in open-ended projects. The Children’s Garden at the School’s Bronx campus functions as an outdoor classroom for gardening and nature study. In the Lower Division, the approach to science evolves over time. In Kindergarten and first grade, formal lessons in science are taught within the context of the overall curriculum. In the second and third grades, science is part of the general curriculum, with one or two formal lessons per week. Students in Kindergarten through third grade participate in open-ended science-related activities and experiments in the Science Center. 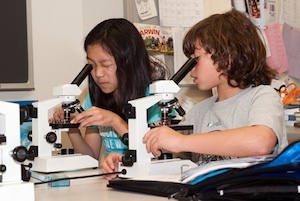 In the fourth and fifth grades, science is taught by dedicated science faculty members, in a distinct laboratory space. The curriculum enables students to explore topics in science and engineering. In their science classes students participate in Lego robotics, build catapults and electrical circuits, dissect squids, and construct and launch hot-air balloons. The Middle Division program is comprised of a three-year sequence focused on the student as explorer, naturalist, and investigator. Students develop skills fundamental to scientific inquiry: determining purpose and method; following written directions; making and recording observations; working together in a collaborative manner; and presenting findings. Sixth graders learn about the universe, the Milky Way galaxy, and planetary motion, and study protists as well as the properties of water, and of oceans. Seventh graders study the natural world with a joint focus on topics in biology, ecology, and geology. The study of plants, seeds, rain forests, genetics, evolution, and primates is integrated with units on weathering, soil, erosion, water systems, landforms, and maps, and with geological fieldwork at the John Dorr Nature Laboratory. Eighth graders balance chemical equations, observe reactions of elements and compounds, investigate acids and bases, study elements of the Period Table, and consider the physical and chemical properties of water and oxygen. They are introduced to the algebraic and graphic expression of physical laws through the study of foundational concepts in classical mechanics and thermodynamics. The curriculum culminates in a six-week elective where students may choose from among several mini-courses with topics selected based on the strengths and interests of the faculty. The Upper Division Science curriculum surveys subjects in the traditional fields of scientific inquiry: in Biology, molecular biology, genetics, physiology, behavior, evolution, and ecology; in Chemistry, atomic and electronic structure, bonding, reactions, stoichiometry, gas laws, states of matter, solutions reaction kinetics, thermodynamics, equilibrium, acids and bases, electrochemistry, organic chemistry, and nuclear chemistry; and in Physics, Newtonian mechanics, thermodynamics, electricity and magnetism, waves, optics, and atomic and nuclear physics. Although only two out of three basic courses in Science are required, the vast majority of students elect to take all three in order to cement a solid foundation for further study. Advanced courses are offered in all subjects, as are Advanced Placement courses in Biology, Chemistry, and Physics, as well as a full range of non-AP science electives such as Biotechnology of Human Genetics, Topics in Physics, Topics in Biology, and Experiments in Physics and Chemistry.